By 1600 the Spanish were firmly entrenched along the coast. Spanish missions and forts were strung along Georgia’s Sea Islands. In 1607 the English established the Virginia Colony. Later, King Charles II granted a charter creating the Carolina Colony with Charles Town (later Charleston) as its capital. The Treaty of Madrid in 1670 separated English and Spanish territory at the 30th parallel, below present-day Charleston. But English traders soon ventured below the treaty line to trade for deerskins with the Native Americans at the falls of the Chattahoochee River.The English set up a stockaded trading post, and Native Americans lived around the post. During this time the trading paths, including the nearby Okfuskee Trail, were busy with traffic flowing from the back country to Charles Town. War, not treaties, eventually determined who controlled the “Debatable Land” between the English Carolinas colonies and Spanish Florida. 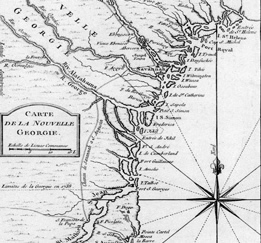 The establishment of the Georgia colony in 1733 by James Oglethorpe and the Trustees was meant, in part, to stabilize the troubled border between Spanish and English settlements. The new Georgia colony grew slowly. When the English colonies declared their independence in 1776, settlement in Georgia remained largely confined to the coast. Below the Ogeechee River, settlers had ventured inland only some 50-100 miles. The area of greatest back country settlement was between the Ogeechee and Savannah Rivers, up to the Broad River Valley located northwest of Augusta. Settlers in this region were mainly yeoman farmers living with their families in log cabins. Plantation slavery, for the time being, remained along the coast. The land between the upper Oconee and upper Ogeechee remained Indian territory until 1790. The land west of the Oconee, including today’s Putnam County, became available with the Treaty of 1802-03.